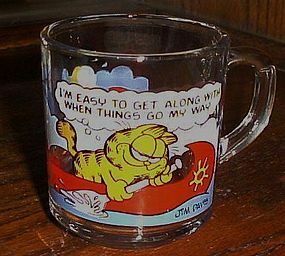 McDonalds Garfield cup It's easy to get along with me..
McDonald's Garfield the cat by Jim Davis, glass cup mug entitled "I'm easy to get along with when things go my way". Perfect bright coloring and No damage. I have several of this series available for purchase. Check out my catalog. 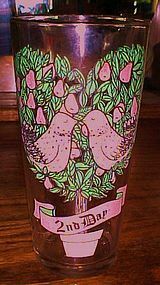 One of the 12 days of Christmas glasses put out by Pepsi. This has the Pepsi logo on the back, and measures 6" tall. 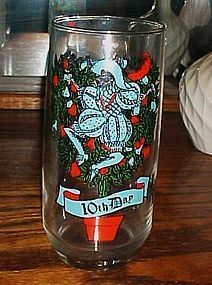 Ten Lords a leaping on the 10 th day of Christmas glass. Chorus and Pepsi logo on the back. Bright crisp coloring and no damages. Measures 6" tall. I have 1st, 2nd, 3rd, 4th,5th, 6th, 7th, 8th,9th,11th, 12th days glasses also. All are perfect, price is for each. Replace your missing ones before Christmas gets here again! 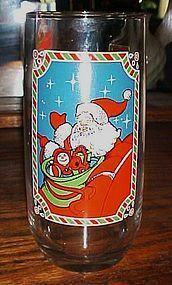 One of the 12 days of Christmas glasses put out by Pepsi. This has the Pepsi logo on the back, and measures 6" tall. 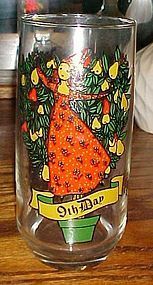 9 ladies dancing 9th day of Christmas glass. Chorus and Pepsi logo on the back. Bright crisp coloring and no damages. Measures 6" tall. I have 1st, 2nd, 3rd, 4th,5th, 6th, 7th, 8th, 10th, 11th, 12th days glasses also. All are perfect, price is for each. Replace your missing ones before Christmas gets here again! 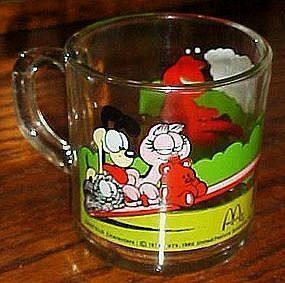 McDonald's Garfield the cat by Jim Davis, glass cup mug entitled "Use your friends wisely". Perfect bright coloring and No damage. I have several of this series available for purchase. Check out my catalog. McDonald's Garfield the cat by Jim Davis, glass mug entitled "It's not a pretty life but somebody has to do it". Perfect bright coloring and No damage. I have several of this series available for purchase. Check out my catalog. McDonald's Garfield the cat by Jim Davis, glass mug entitled "I'm Not One Who Rises to the Occasion." Perfect bright coloring and No damage. I have several of this series available for purchase. Check out my catalog. 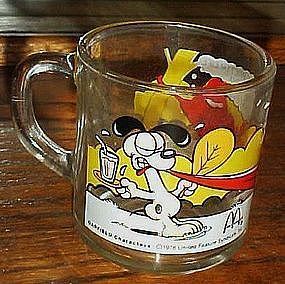 One of five different Camp Snoopy promotional drinking glasses from McDonalds in 1983. 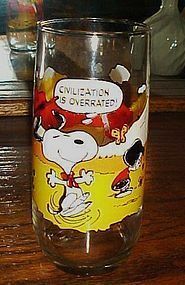 This one is "Civilization is overrated", with Snoopy, Linus and his little sister, Charlie Brown and others from the Peanuts gang. Perfect bright condition. Measures 6" tall. Add it to your peanuts collection! 4 available in this pattern. Price is for each. Check out others from this collection I have listed. 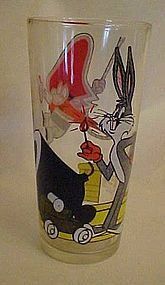 One of five different Camp Snoopy promotional drinking glasses from McDonalds in 1983. 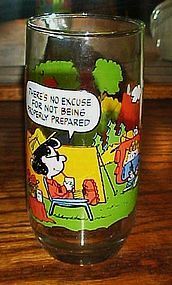 This one is "There's no excuse for not being properly prepared", with Snoopy, Woodstock, Charlie Brown, Linus, & Lucy being the focus. Perfect bright condition. Measures 6" tall. Add it to your Peanuts collection! 2 available in this pattern. Price is for each. Check out others from this collection I have listed. 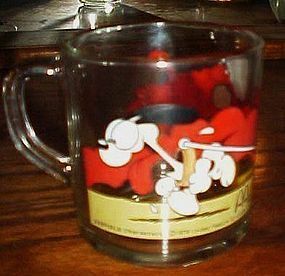 One of five different Camp Snoopy promotional drinking glasses from McDonalds in 1983. 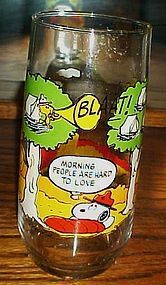 This one is "Morning people are hard to love", with Snoopy, Woodstock;s and Charlie Brown. Perfect bright condition. Measures 6" tall. Add it to your peanuts collection! 2 available in this pattern. Price is for each. Check out others from this collection I have listed. 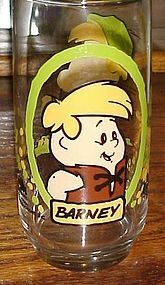 Flintstone Kids Barney Glass for Pizza Hut 1986 Hanna Barbara. Everyone loves the Flintstones, and this is Barney Rubble when he was just a kid. The graphics are crisp and bright. Made by Libbey Glass. 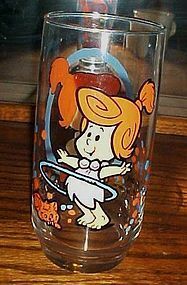 OPENING 2 1/2 ", DIAMETER 5 3/4 " HEIGHT 5 3/4 "
Flintstone Kids Freddy Glass for Pizza Hut 1986 Hanna Barbara. 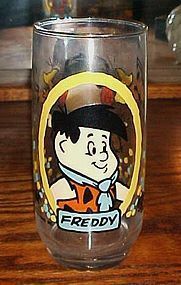 Everyone loves the Flintstones, and this is Fred when he was just a kid. The graphics are crisp and bright. 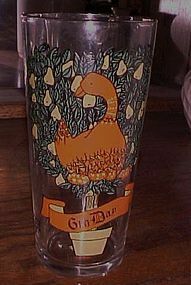 Made by Libbey Glass. 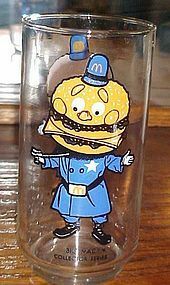 OPENING 2 1/2 ", DIAMETER 5 3/4 " HEIGHT 5 3/4 "
McDonalds Big Mac Collector Series Glass, Libbey. Excellent condition, with bright crisp colors. Measure about 5 5/8" tall. 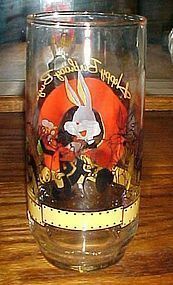 This is a glass from the Pepsi collectors series Warner bros. 1976 and features Yosemite Sam with Bugs Bunny in a pirate scene. The picture is in excellent condition with brigh crisp coloring. Measures 6 3/8" tall.